If you have a transportation change request for your child, please make sure to become familiar with the new procedures. 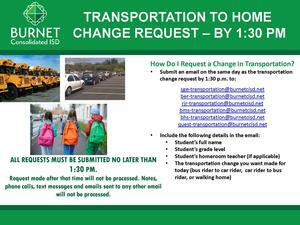 All requests must be submitted by email no later than 1:30 p.m. Requests made after that time will not be processed. Please see attached flyer for complete details.